It’s been a busy January in terms of my USTA and ITA “Official” duties. Between Junior events, Adult League Mixed events, and the Cal Winter Invitational, every weekend has been booked with time spent watching some great matches. While doing so, I’ve noticed a few things that might be helpful to others as they prepare for the 2014 Adult league and tournament season. 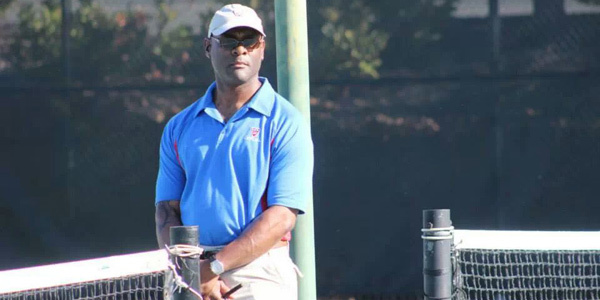 Here are three tips to help your upcoming USTA season be more productive and sporting. Come prepared for a five-minute warm-up! One of an official’s duties is to time the player warm-up prior to matches in officiated league events and tournament play. While doing so, I’m often struck by how unprepared many players are for the quick pace of their five-minute warm-up. Five minutes seems like a good amount of time until you think about all of the tasks you might want to accomplish in your warm-up. When you attempt to do all of these things with one or more other people on the court also trying to do them, the results can be less than satisfying. Remember that the five-minute warm-up is NOT your match warm-up. If you come to the court without having warmed up in some other way prior to the match, it’s not your opponent’s job to do that for you; nor is it the official’s job to give you extra time. 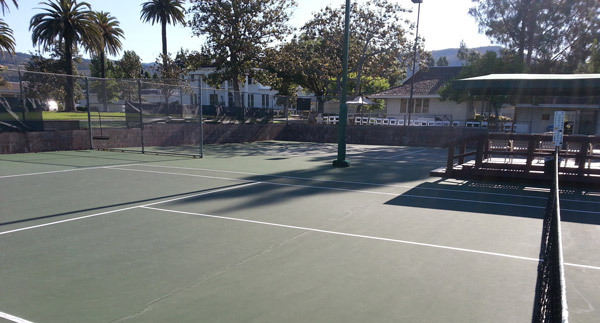 If possible, grab a side court to hit with a friend or doubles partner. If no courts are available, you can still do shadow swings and footwork drills to prepare yourself for the match. When you go to court for your match, know exactly what you want to accomplish so that you can stay focused and not lose time. And prioritize! You may not get to do everything you want to do, but you can at least make sure that your basic needs are met to start play. A lot of time is spent in matches correcting scoring errors. Whenever officials hear talking, then see players conversing at the net, it’s almost always a scoring discrepancy. This can easily be alleviated by calling out the score before each point in a manner that’s loud enough for your opponent to hear. If he disagrees, you can fix it before the point instead of creating more confusion “after the fact”. Also, it’s extremely helpful for all if you use the correct terms for calling out the score. If the score is 15-40 and you say 5-4, or you say 3-5 for 30-15, you’re probably going to run into some issues. Remember, keep it loud, and avoid shorthand scoring. This isn’t just about making correct line calls, it’s also about being honest with your opponent when asked about the call if it was out. Often, an opponent may balk at a close call of “out”, or ask as an FYI how far out the ball landed. If asked, be honest about the distance. If the ball landed one inch outside of the line, don’t say, “It was WAY out”. You’re not being honest, and you’re also not contributing to an environment of “good sportsmanship”. Say it was close, or a couple of inches, or something along those lines. Your opponent will appreciate the honesty, and will less likely think that you are cheating on calls. Arthur Ashe Kid’s Day is a high-profile example of the USTA’s efforts to encourage kids of all ages/levels to play and enjoy the game of tennis. But if the trip to NYC is out of your reach, your local USTA chapter also runs events designed to help kids learn and love the game. The courts dried quickly once the sun came out. 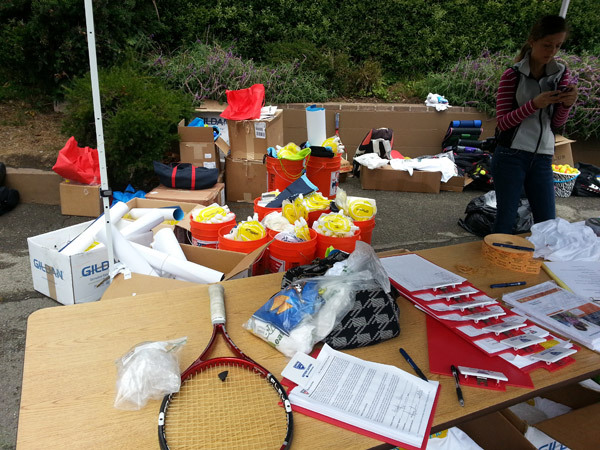 Back in those days, the NJTL provided free tennis racquets to the participants. But though it’s more costly to provide free racquets these days, the NJTL still provides opportunities for kids to play the game who might not otherwise have the means to do so. 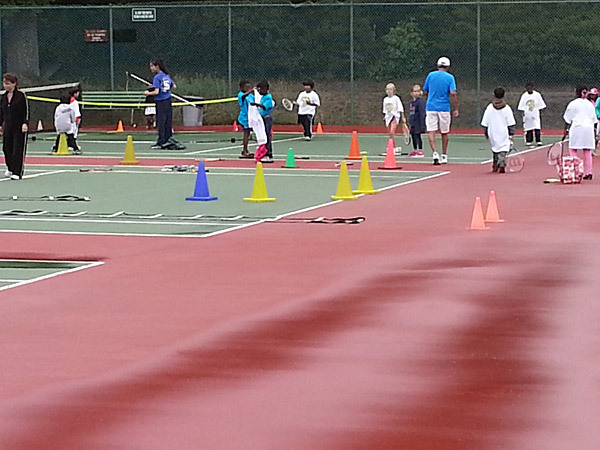 It’s one of the most important aspects of the USTA’s youth outreach efforts. 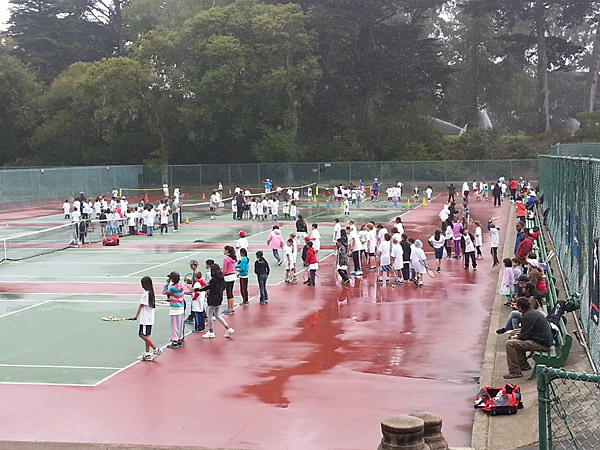 On this day, roughly 300 kids showed up to participate in games designed to help improve their footwork and hone their racquet skills. Courts were divided by age and skill levels, allowing everyone a chance to participate at the appropriate level for them to hit and have fun with others. 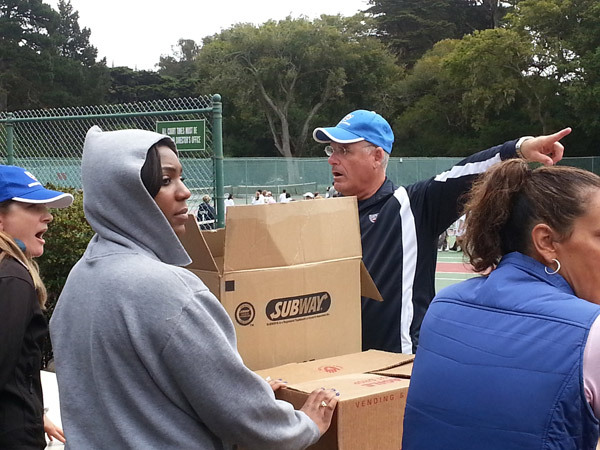 It was an impressive achievement by USTA NorCal staff, led by executive director Steve Leube. They were aided in their efforts by a dedicated group of volunteers from the participating NJTL groups. Steve has coordinated the Regional Rally for several years, and was completely undaunted by the elements. 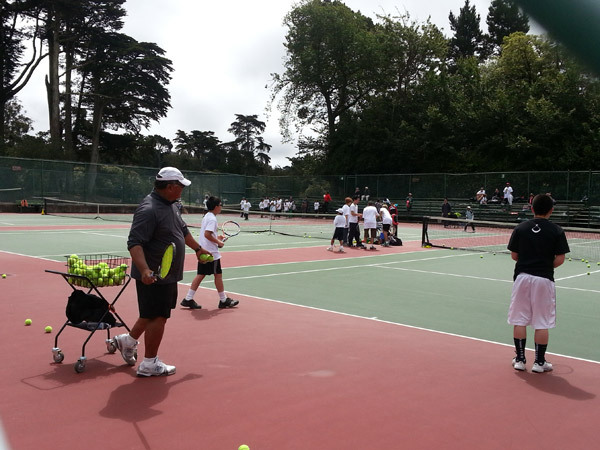 After water was squeegeed off the courts, he had the volunteer instructors put the kids safely through their paces in short court games until the backcourt areas dried out sufficiently for play. Though he had to keep a watchful eye on the proceedings, Steve and I chatted for quite a while about the USTA’s commitment to youth tennis. Steve is less concerned about churning out pros than he is in helping kids become productive adults. As with many sports, tennis helps kids become more active and, hopefully, live healthier lifestyles in the long run. More important to Steve, it can also be a valuable source of life lessons, teaching kids about problem-solving, fair play, and being a gracious winner or loser. 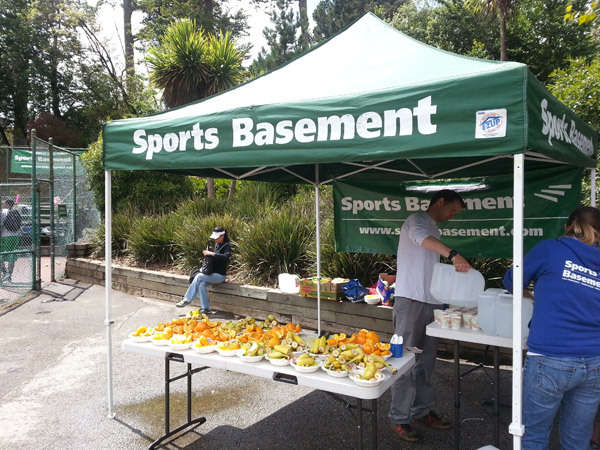 Sports Basement, a sporting-goods retailer, was a Regional Rally partner; providing snacks for the competitors. Participants also received lunch from Subway. This may not seem like much, but every donation has a huge impact on kids who wouldn’t normally have access to this type of activity. 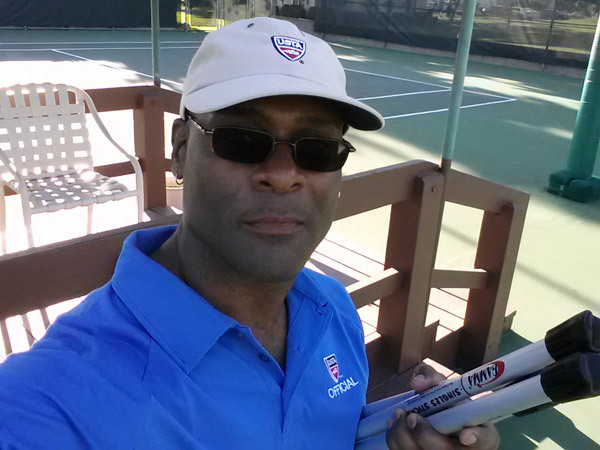 My start with the NJTL of Cleveland gave me not only my first racquet, but a love of the game that’s going strong almost forty years later. So the work that Steve and his staff are doing is significant. And with that work, one can only hope that these kids are inspired to do great things, regardless of whether or not it’s on a tennis court. Match Notes: WIND! That was the word of the day, and the deciding factor in the match. 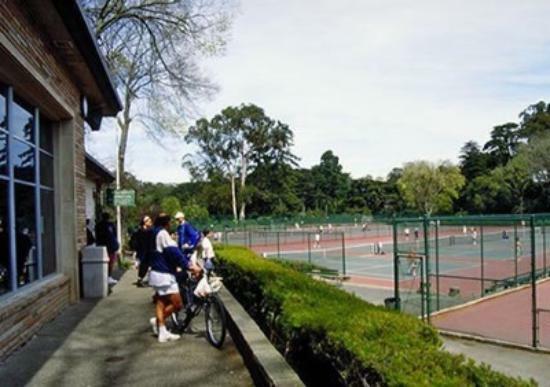 The winds at Golden Gate Park were swirling in all directions across the back courts. If you moved well to handle the wind, you did okay. If you didn’t move well, you didn’t do okay. It was as simple as that. My partner for today’s match was Casey, a teammate I’ve known for years (and I do mean years!) He hits a great ball that is fairly flat and stays low. He suggested taking the ad court, so I took deuce. Our opponents were a mixed-level pairing. One was extremely strong with great strokes on both sides, heavy topspin, excellent volleys, and a decently-paced serve that rarely missed. (Had an excellent body serve too!) The other hit two hands on both sides and was a little inconsistent. But he could also send balls back awkwardly by virtue of sticking his racquet out and making minimal contact. I got caught flatfooted a couple of times by those frustrating shots. Breaks of serve will kill you in dubs, and we lost by a break in the first set, and two in the second set. What’s worse is that we were up 4-1 in the first before going down 7-5. For my part, and was disappointed in my lack of footwork in the wind. I didn’t keep my feet moving, and often found myself out of position and reaching for shots. That’s not a recipe for clean tennis under these conditions. It’s always good to focus on the positives afterward too, so here is a bright spot from today’s loss. Sometimes when I face an opponent that I know is very good, I try too hard to hit great serves/shots and end up giving away free points. I kept that in check today and didn’t overplay my serves or shots. I only wish I could have handled the wind as well I did with my internal expectations. This past weekend was great, and not just because I avoided the Bay to Breakers masses running by my front door. I’ve mentioned before how much I enjoy officiating for juniors, and this past weekend at the 2nd Annual Silverado Resort and Spa Junior Open was no exception. I had a great time! There’s something inspiring about junior tournaments that you don’t get with adult events. Yes they can sometimes be more work, but when you officiate for juniors you have an opportunity to educate them about the game. Hopefully, this will ensure that they’ll understand and enjoy it more as they get older. As a tennis player, I’m also inspired by watching 12 and 14 year-olds with awesome technique hit the ball cleaner than most guys on my USTA team, myself included. Watching them hit deep shots with great topspin and control, you realize that size doesn’t matter, muscle doesn’t matter, but good technique DOES matter. On top of their technique, it’s also great to see their competitive fire. 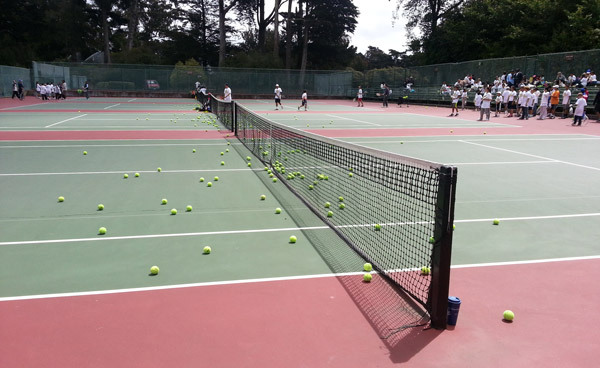 One particular match featured 12 year-olds competing hard in a match featuring 10+ shots per rally, with many of them hitting the baseline and sidelines (with no calls for a line monitor either). Both players had strong serves, excellent returns, great groundstrokes, and tenacious defense. Interspersed with the excellent play were acknowledgements of “good shot” from both. I dare anyone to watch a match like that one and not “feel the love” for the game. 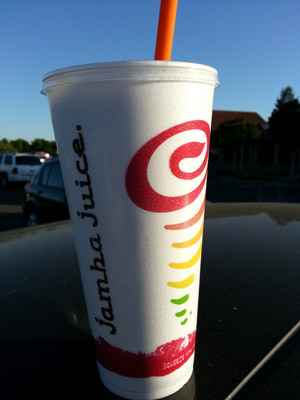 Reward for a great day! Far and away, one of the best things about officiating for juniors is the personal thanks you receive from the competitors and their parents. My personal horror aside at being called “Sir”, I’m touched every time a competitor shakes my hand and thanks me for helping them with whatever aspect of the match in which I assisted. Even parents are thankful, regardless of the win/loss, because they realize that your presence means that the match is fair and more fun for all. The Silverado facility was great, and the staff was top-notch. Jacob Hansen ran a great tournament, and every parent I talked to had nothing but great things to say about the event. I might be a representative for the USTA, but a great staff makes my life a whole lot easier and way more enjoyable. Last thing, I’m beginning to have a strong sense of what’s important to me as an official. It’s my duty/desire to help ensure a fair tournament for all because of my own love for the game of tennis. And I hope that’s evident, and contagious! Match Notes: Lost a tough one today in doubles 1 and 2. The fact that we were out there a long time for that score doesn’t make me feel any better about the loss. I didn’t play badly, but I certainly didn’t play well enough to combat the seasoned doubles play of my opponents. Also, I hadn’t played since last week’s match, and I could definitely have benefitted from a midweek hit. That wasn’t possible after getting a mild case of food poisoning. I pretty much just had to chill most of the week. But since tennis is a game of familiarity and feel, I wasn’t as on top of my game today as I could have been, and it showed. Especially on my serve. My groundstrokes were decent: forehand more so than backhand. The main issue today was my serve. There were no “Sharapova” moments like last week, but it was still a mediocre service day. I couldn’t get it out wide when I needed, and didn’t put nearly enough first serves into play. I held 2 of 4 times at the service line, and that’s not nearly good enough at the 4.0 level to get the job done. Earlier this season, one of my teammates and I talked about the need to play at least 2-3 times a week in order to be ready to compete at this level. I did that heading into last week’s match and came out with a win. I wasn’t able to this week and came away with a loss. Midweek practice might not necessarily have produced a win, but it sure would have made my overall game a lot tidier today. Match Notes: After the slice and dice nightmare of last weekend at SFTC, I made a return to winning ways in today’s doubles match with my partner Eddie. Conditions were mostly fine in spite of a few sprinkles. Temperature was pretty mild, and the early winds died down as the match progressed. I played doubles with my buddy Eddie, a tricky lefty who hits with almost as much spin as Rafa (j/k, but only slightly). He’s solid on both sides with lefty spin and an ability to work crafty angles. He’s also aggressive at the net (which makes my life easier when serving). With his strong lefty game and my pace, we’re a formidable team if we execute well. Our opponents were decent players. One had great hands at the net and came in whenever possible. The other was okay from the baseline with a strong serve, but prone to to mishits if pressured. It was a little hard to gauge how we would match up at first, but I felt pretty good about our chances. After falling behind 1-3, we pretty much steamrolled through the match. 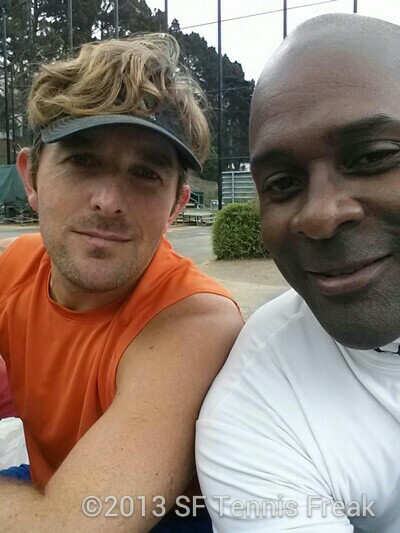 Between my pace and Eddie’s spin, they had a difficult time with our groundstrokes. And though the one guy had great hands on his volleys, there’s not much he could do if we hit at his feet or passed him. Mentally I stayed calm/relaxed throughout, and all aspects of my game felt good. FH crosscourt returns were blazing, down the line were untouchable, BH slice was on, and the serve was working well. My only blip, and it was a big one, was a horrific service game to start the second set. I “pulled a Maria”, double-faulting 4 times to give them a one game headstart. What can I say? Since shoulder surgery, it occasionally happens. Eddie didn’t walk off the court in disgust, though, so I knew we’d be okay. I understand, Maria, really I do!